Okay, suppose that you’re keen on the idea of using hydrogen peroxide in gardening, but you just want to know how to apply it.... Okay, I’m ready to explain! As usual, there are options -- there are several ways to go about feeding hydrogen peroxide to your garden. The chart here shows the quantities of water and hydrogen peroxide to use for applying hydrogen peroxide in gardening. You can mix peroxide into a whole bucket of water, or just into a glass of water, whatever amount you need. The same mixture of peroxide and water can be used for watering houseplants as well as plants that are in the ground. So, a glass of water may be all you need for an indoor plant, where you'll need a bucket to mix enough to water a tree or a flower garden. Whatever size container you use, it is simple enough, just mix in peroxide as shown. 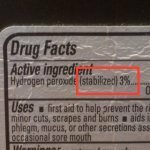 Take care to be sure you are using the right column in the chart depending on whether you are using 3% hydrogen peroxide or 35% hydrogen peroxide!! 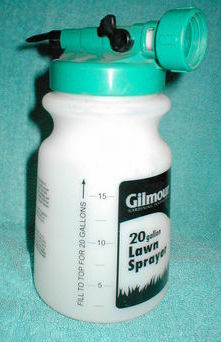 There’s a sprayer device that can be found at hardware and garden stores. It’s a great gadget to have -- mine says “lawn sprayer” on it. It’s got a plastic reservoir (mine holds around 3 cups). You fill this container up with liquid fertilizer (or liquid pesticides, I suppose, for those who use such horrid things, but let’s no go there)…. Then you attach the whole thing to the garden hose... (There’s a connector that is threaded just right to attach a garden hose)… Then you turn the hose ON -- and out comes a very diluted combination of whatever's-in-the-reservoir plus lots of water. It comes shooting out, just as water out of a hose -- and you use it to water the garden. It takes a while to use up the 20 gallons of water as it comes streaming out of the sprayer. The sprayer I have mixes the liquid in the container (about 3 cups) into 20 gallons of water. Another model might be set up for a different amount. Anyway, it is calibrated, so it’s all set up to dilute the stuff in the container to a particular level. Since mine is set up for 20 gallons, I need to put the correct amount of fertilizer into the reservoir to treat 20 gallons of water. So, since the reservoir on my sprayer holds about 3 cups of liquid, the way to add ¾ cup of 35% peroxide to 20 gallons of water, using this sprayer, is to dilute the peroxide in the reservoir. Put 3/4 cup of 35% peroxide into the container, then add water to fill it up. This mixture will be mixed into 20 gallons of water. By the way, this is one of the applications where 35% peroxide is handy. Checking the chart for how much peroxide to use, you'll see that with 3% hydrogen peroxide, you could use 10 cups of peroxide to 20 gallons of water. But you can't put 10 cups of liquid into a 3-cup container! So, using 3% peroxide, you would have to use a more dilute solution -- which is also okay. Filling the container with 3 cups of 3% peroxide would be be fine – this would be somewhat more dilute than necessary, but this would still work just fine. However, by using 35% hydrogen peroxide, you're more able to control the concentration, and it's easy to use 3/4 cup of 35% peroxide in the sprayer -- just add water to fill. If you take baths with hydrogen peroxide, you may want to run a hose from the bathtub to the garden and then start a siphon to move the water from the bathtub, out through the hose, and on to the plants and the soil. You could also carry the water out to the plants a bucket-full at a time. This is just a way to re-use the same hydrogen peroxide in gardening as you've used in the bath to soak in, making another use of it, instead of sending it down the drain. Of course, you would not want to reuse your bath water in the garden unless everything in the bath water is biodegradable and safe for your garden. That includes: no commercial shampoos, no creme rinse, no Epsom salts, no salt scrubs, no chemicals that would be harmful to plants. If you want to reuse your bathwater in the garden, you’ll need to limit yourself to water, peroxide, and biodegradable soap in the bath. The mixing chart includes a row with the amount of water in a bathtub. However, bathtubs vary, so yours may hold more of less than the 25 to 35 gallons of water that I’ve listed. Just use whatever plant “mister” (device) you have. Put the water-and-peroxide mixture in, and mist your plants with it. So, what's the best way to apply hydrogen peroxide in gardening? The simplest way to start out is just to mix peroxide into some water, in a bucket or any container, and use it to water your plants. Then, if you want to continue to use hydrogen peroxide in gardening, you can try all the ways I've listed, to see what works best for you.... and maybe you'll find a few additional ways to apply hydrogen peroxide in gardening that I haven't thought of.